What is your nose type? 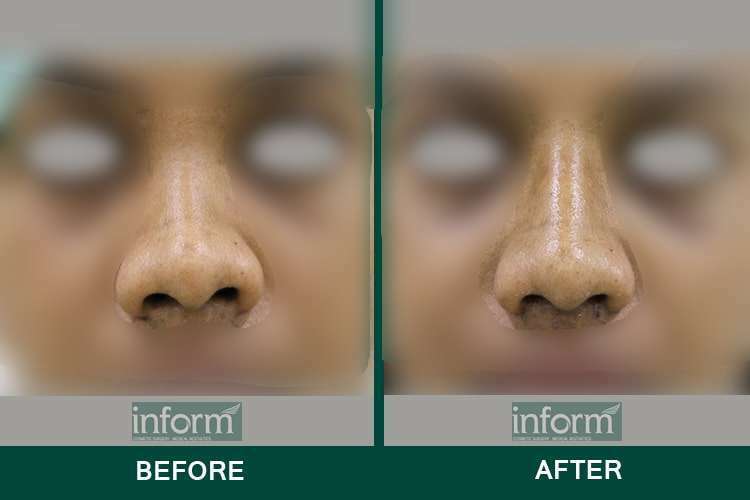 How do you want to shape your nose? Rhinoplasty is also popular as a nose job or nose reshaping which is a reconstructive procedure that aims at enhancing the facial harmony and proportions of the nose. It is generally used to rectify impaired breathing that is caused by structural nasal defects. In a recent report, it has been noticed that Rhinoplasty has now been the most popular reconstructive surgery that majority people undergoes. While performing a Rhinoplasty, a surgeon usually sculpts a cartilage and bone of the nose to achieve the desired appearance. So people irrespective of men and women may undergo a nose reshaping surgery or a nose job that offers the best, safe cosmetic solution. One of the most common corrections that are covered by Rhinoplasty is a deviated septum that is caused due to any breathing impairment and is achieved by adjusting the nasal structure that helps in a better alignment. But before undergoing this surgical procedure, it is very important for the people to choose an experienced, skilled cosmetic surgeon. It is important to consider few factors that are important are the cost, risks and benefits of the procedure. The people undergoing the procedure must keep a positive and realistic expectation from the procedure because this surgical procedure simply aims at creating a facial balance and also improves any obstructed airway, if present. People not only undergo Rhinoplasty for aesthetic purposes but also to address some structural deformity. The best part of undergoing a Rhinoplasty is achieving an enhanced facial contour that was long desired and expected from the procedure. Some patients with some structural deformities are not able to breathe properly, so undergoing a Rhinoplasty may eliminate any type of breathing difficulty like snoring or sleep apnea. By achieving an enhanced appearance, the patients are able to gain confidence and restore their inner beauty. Additionally, Rhinoplasty is very quick service that provides the solution in less than 2 hours and requires only a few weeks to recover completely. It is generally a safe procedure and can be applied to a large number of patients. It can be performed by using several techniques so individuals can be treated easily with customised treatments. The candidates after undergoing a Rhinoplasty surgery, do not involve a long recovery time, so they can easily resume normal activities within few days of undergoing the procedure. Before beginning with the surgical procedure, the candidates are administered with local or general anaesthesia (as required). The choices depend on what the surgeon considers best for the patients. Rhinoplasty is either performed using a closed procedure, where the incisions are made concealed within the nose. Or alternatively, the open procedure may also be applied where the surgeons makes an incision across the columella. A columella is a narrow strip of tissue that separates the nostrils. Now, through these incisions, the skin that covers the nasal bones and cartilages are moderately upstretched that allows in reshaping the nasal structure. A Rhinoplasty can rectify an overly large nose into a smaller one by removing the underlying bone or cartilage. Sometimes, the surgeon may also require adding some cartilage grafts. Most commonly, the cartilage is extracted from the septum. The septum is the partition in the middle of the nose which is used to serve this purpose. In very rare cases, this cartilage may also be obtained from a rib cartilage. Rhinoplasty can also rectify a deviated septum and successfully straighten out the presence of any projections that are made inside the nose and is reduced to facilitate an improve the breathing system. Finally, at the end of the procedure, the underlying structures of the nose is sculpted to the desired shape, nasal skin and tissue are redraped and incisions are closed. Some additional incisions may also be placed in the natural creases of the nostrils to alter their size and shape of the nose. Immediately after undergoing the procedure, the nose is supported with splints and gauze to support the structure of the nose as it heals. The results are mostly not achievable immediately after undergoing the procedure. It may take six months or even year for the final result to appear. Reduction Rhinoplasty- A reduction Rhinoplasty is one of the most common types of nose reshaping surgery which can address any bumps on the bridge of the nose, an elongated nasal tip, or excessively flared nostrils. Here the surgeon removes a small amount of bone or cartilages to achieve the desired results. Augmentation Rhinoplasty- An augmentation Rhinoplasty is also another popular type of nose reshaping surgery that is performed to build up the nasal tip with bones or tissues. Surgeons may also use some cartilages from other parts of the nose usually the nasal septum and rarely from the rib. Post-traumatic Rhinoplasty- If a patient has suffered a nose injury then the candidate may benefit from a post-traumatic rhinoplasty. This is such a surgical procedure that can be addressed to rectify both functionality and appearance as well. Patients with broken nose require to re-fracture the nose and achieve the desired results within few days. Reconstructive Rhinoplasty- Patients may also require undergoing a reconstructive rhinoplasty for cases undergoing an accident, skin cancer or any other serious illness. In such cases, the surgeons usually rebuild the nose by using skin grafts or flap techniques. Patients may also require undergoing multiple surgeries for over a period of several months. Normally patients are able to return to work within two weeks after following the procedure. However, strenuous activities or exercises must be avoided until recovered completely. Applying sunscreen is mandatory when the patients are exposed to the sun. Wearing glasses is also prohibited for at least four weeks after undergoing the procedure. If patients find any complications other than this, then they must go for a follow-up appointment with their surgeon. The first check-up is usually after a week of undergoing the procedure. During this consultation, the surgeons will remove the stitches and nasal packing for the next several months. Rhinoplasty is a nose reshaping surgery that is generally used to correct a number of aesthetic flaws. The surgery can result in creating a greater balance of facial features by eliminating bumps or unevenness. Some alterations in the shape and size of the nose may also be noticeable in order to achieve the ideal results. It is very important for the candidates to keep a realistic expectation and a positive outlook from the procedure. The patients must remember that undergoing a Rhinoplasty surgery is not about achieving a perfect nose but it is about correcting any defect. 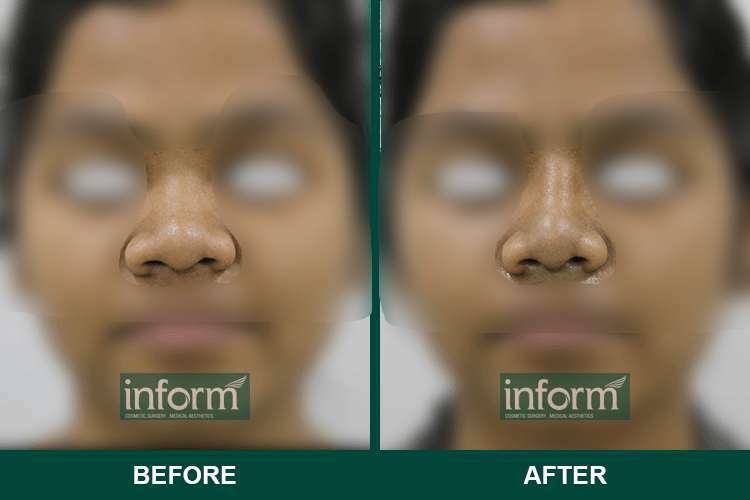 Rhinoplasty is such a cosmetic surgery that helps in taking up one full year to develop for achieving the final results. Even though it is considered as a safe procedure, however, Rhinoplasty still includes some major side effects like swelling and bruising around the eyes and nose for about two to three weeks. Most of the patients are able to notice some visible changes in the first week after following the surgery. Within few months the final result will be visible. Other side effects may include anaesthesia risks, infection, poor wound healing, change in skin sensation, difficulty in breathing, unsatisfactory result, etc. As with people undergoing an open Rhinoplasty may have some possibility for scarring since the incisions are made across the nostrils. Because in closed rhinoplasty all incisions are made inside the nostrils. But none of these incisions will be noticeable since the size and location of the incisions are hardly noticeable. 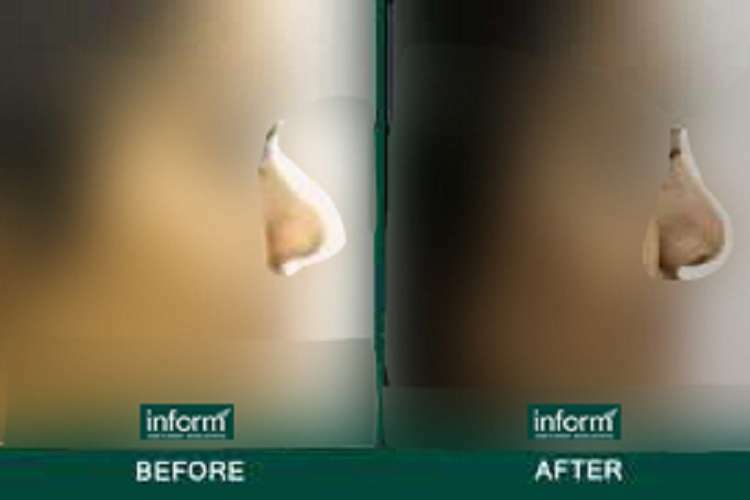 Rhinoplasty can exhibit lifelong dramatic results on the appearance of patients. Therefore, it is very important for the candidates to be judicious about choosing their plastic surgeon. So before undergoing a Rhinoplasty procedure, it is very important for the patients to cherry pick a surgeon who is adept at performing such reconstructive procedure. Additionally, Rhinoplasty is also a highly personal procedure, so the patients need such surgeon with whom the patients can feel comfortable enough. Now finding such a trustworthy and experienced surgeon may be a serious concern for many people. 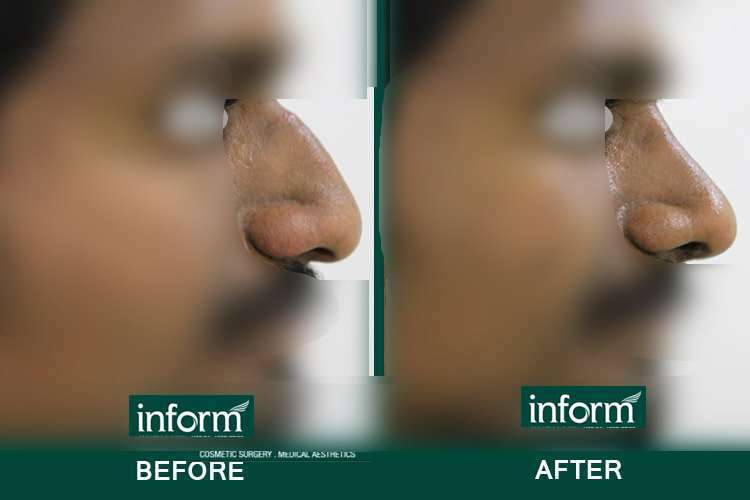 So Inform Clinic in Hyderabad is a one-stop destination for any cosmetic and reconstructive surgery. The clinic has a group of surgeons who are board certified, well trained and experienced surgeons. The nurses, technicians are also well trained and they provide their services to make their patients feel comfortable. The centre also maintains high safety standards, hygiene and uses proper latest technologies that add a star to their surgical facilities. Therefore, cherry-picking Inform Clinic for undergoing such reconstructive procedure may be the best possible option. After selecting a surgeon, the doctor usually schedules a comprehensive consultation with the patient where they can discuss all the goals, risks, and complications of the surgical procedure. Now, after getting to decide the procedure to be undergone, the surgeon moves to the next step where he verifies the candidacy for Rhinoplasty. The surgeons take a look at the patient’s health record and verify the medications administered. Candidates who smoke are definitely not disqualified from undergoing Rhinoplasty but they are instructed to stop smoking for at least two weeks after undergoing the procedure. There are certain medications too that may impair the healing process, which is also restricted. The surgeon then checks the skin quality, shape and the condition of the nose before undergoing the procedure. After determining the condition of the patient, the plastic surgeons encourage the patients to actively participate in developing a treatment plan. On the day of the procedure, the patients are administered with general or local anaesthesia to make sure that the candidates experience no pain or discomfort during the procedure. The procedure is aimed at making the desired changes in the nose and then suturing up the incisions. The newly acquired nose structure is supported with gauzes which must not be removed until the surgeon instructs. The stitches are removed after a week of undergoing the procedure unless they are self-dissolvable stitches. Immediately after undergoing the procedure, the patient experience some pain, swelling and discomfort. The surgeon provides some medications and instructions that the surgeons must follow in order to achieve a complication free result. Special care must be taken on diet and leading a healthy lifestyle. Candidates are strictly restricted to smoke during their healing process since the nicotine content impairs any healing procedure. The patients are able to resume normal activities after a week, but they do have some restrictions about undergoing some strenuous activities. 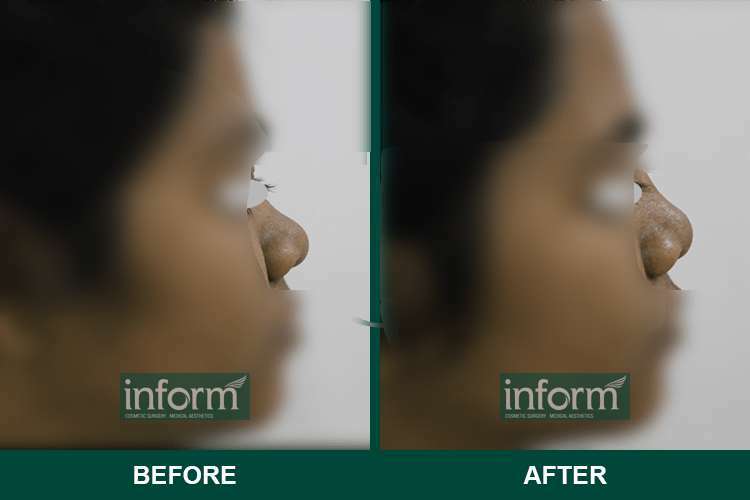 Some modification in the shape, size and structure of the nose is almost visible and the ultimate result is usually visible within few month of undergoing this reconstructive surgical procedure. However, it is very important for the candidates to keep a positive outlook and a realistic expectation from this surgical procedure. 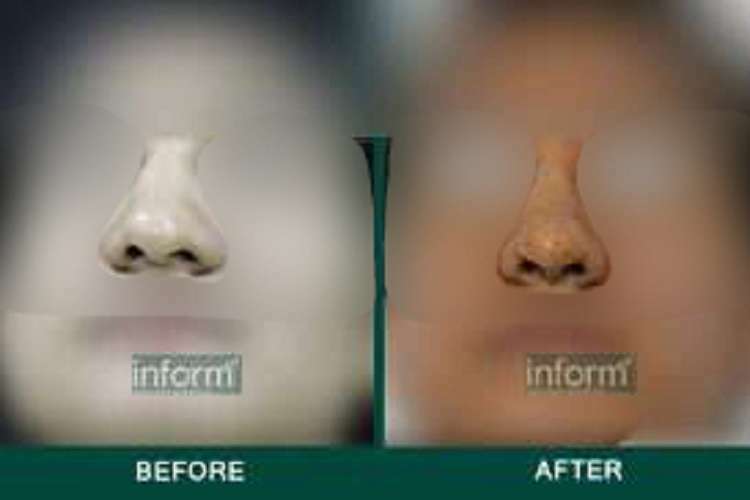 Rhinoplasty costs may highly vary depending on various factors like the amount of work desired, necessity of any additional grafts, the presence of some functional components, nose, the severity of the condition, locational of the clinic, experience and reputation of the surgeon and many other factors. The surgeon's experience is no doubt one of the most important factors that may affect the final cost in the bill because in most of the cases it has been found that surgeons with widespread experience claims for higher professional fees. The complexity of the procedure may also highly affect the total cost. Other additional charges that might add up to the bill are anaesthesia fees, cost of medications and tests undergone. It is also worth mentioning, that the total cost of the procedure may not be affordable by everyone since it is not covered by ay insurance companies. Who are the good candidates for undergoing the procedure? 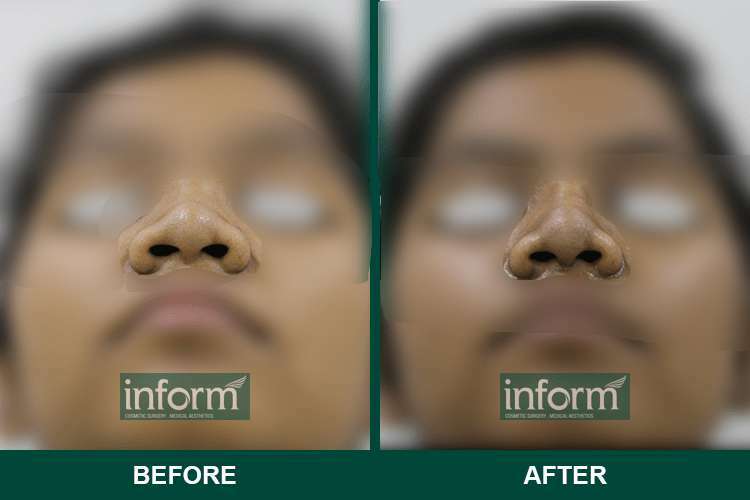 People who wish to undergo a Rhinoplasty procedure are mostly dissatisfied with the appearance of their noses and wishes to improve the proportions of facial features. There are only a few people who undergo Rhinoplasty to alleviate breathing difficulties due to any structural irregularities in the nose or previous nose injury. Overall candidates must be in a good healthy condition, with no complicated medical circumstances. It is most important for the candidates to keep realistic expectation from the surgery. Candidates who are addicted to smoking must be determined enough to quit smoking at least two weeks before and after undergoing the procedure. Healthy adults and teenagers who are above fourteen years and have a fully developed nose are best recommended for such reconstructive procedure. What kind of incisions and dressings are used in Rhinoplasty? The incisions used during Rhinoplasty depends on the approach utilised to obtain the desired result. For cases of closed Rhinoplasty, the incisions are made within the nose hence they won’t be that visible. On the other hand, when the incisions are made with an open Rhinoplasty, the incisions are made across the columella or on the septum. But these incisions are too small to be noticeable. After the completion of the procedure, the nose is usually found taped with some bandage. The nose is kept packet during the first week after the surgery. This packing helps in maintaining the nasal bones. Some amount of gauze may also be kept under the nose for the first few days that acts a nasal drainage after undergoing the surgery. The patients hardly experience any pain during the procedure due to the effect of anaesthesia. When the anaesthesia effects wear off, the patient may experience some pain and discomfort. But the surgeons prescribes some medications for pain, to alleviate the problem.